Teatourist has provided me with the Magic & Mischief Collection for the purposes of providing an honest review. Teatourist curates and produces monthly tea subscription boxes. 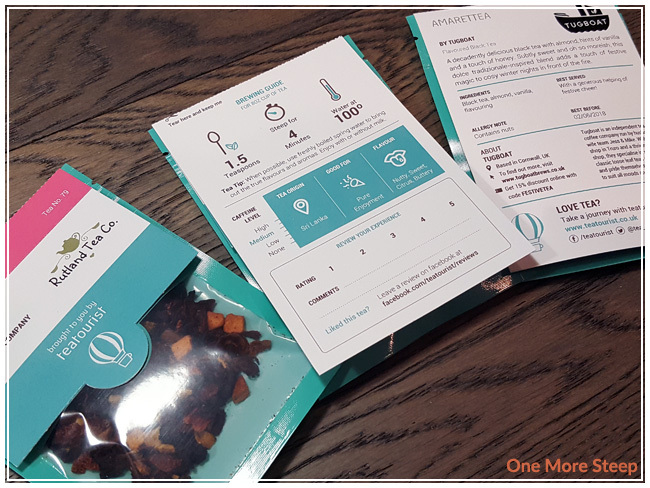 Each box comes with 6 different tea samples, containing enough tea to have 3-4 cups per tea, ranging from £11 (for a monthly subscription box) to £15 (for a one-off themed box). The packaging is beautiful, I love the bright colours. Each tea sample comes in a sealed (and resealable) plastic bag, with a corresponding card that can be taken apart. The tab over the front identifies the tea, while the rest of the card gives information on steeping instructions, the flavour profile, ingredients, and about the tea company itself. The Magic & Mischief collection consisted of 6 teas plus a sample of fudge. The fudge didn’t last long after I started taking photos but I can tell you that it was delicious. The teas are: Mulled Wine Infusion (fruit tea) by Rutland Tea Company, Christmas Cake (black tea) by Bluebird Tea Co., Amaretta (black tea) by Tugboat, Cranberry Sauce (rooibos tea) by Parched Tea, Le Beauté Tea (herbal tea) by Pacifique Herbal Infusion, and White Christmas (white tea) by Nothing But Tea. 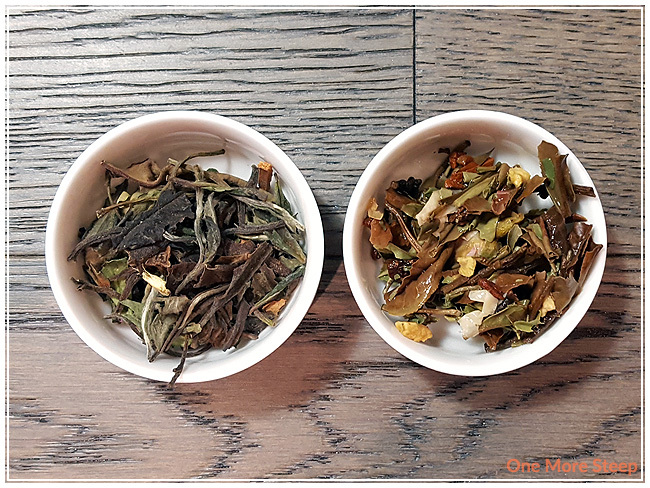 Because it’s already February (customs/post took a bit longer than expected due to holidays/customs) and this was the December box, I’ll be sharing my thoughts on three of the six tea blends. I’ll focusing my review on: Amaretta by Tugboat, Le Beauté Tea by Pacifique Herbal Infusion, and White Christmas by Nothing But Tea. 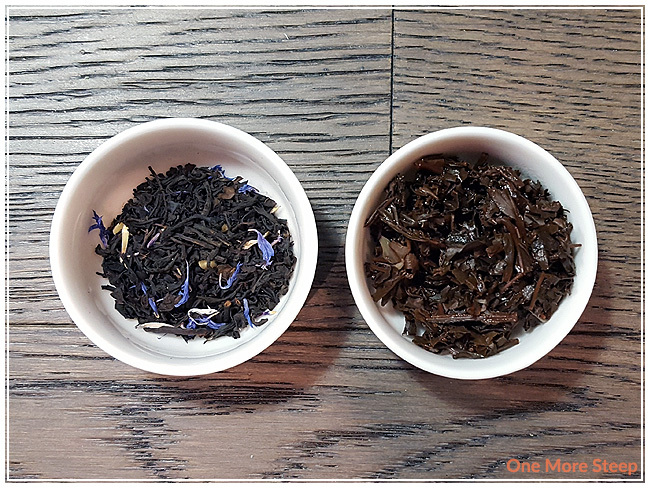 Clockwise from top: White Christmas, Le Beauté Tea, and Amaretta. Amaretta is a flavoured black tea and consists of: black tea, almond, vanilla, and flavouring. There’s also what appears to be cornflower petals in the mix as well. The aroma is very strongly of almonds, with a hint of vanilla. It brings to mind of Christmas baking to me. Le Beauté Tea is an herbal infusion, and consists of: quince, ginger, apple, carrot, lemongrass, spearmint, mallow, verbena, cranberry, cornflower blue, and natural flavouring. I definitely smelled the lemongrass, mint, and ginger when I opened up this bag. It’s very strong of those flavours – they’re quite aromatic and it has a nice brightness to it. White Christmas is a flavoured white tea and consists of: white tea, cinnamon, cloves, ginger, nutmeg, and rose petals. I think of the three, this one I would say is the prettiest. It has a beautiful aroma – primarily that of the cinnamon and ginger. As an aside, the fudge is Orange Chocolate Fudge by Fab Fudge and was yum. Amarettea (from Tugboat): steep in 100°C (212°F) water for 3-4 minutes, with a suggestion that it can be enjoyed with or without milk, sweetened to taste (and possibly with some brandy as well). My initial steep of Amaretta was for 3 minutes. White Christmas (from Nothing But Tea): steep in 80°C (176°F) for 2-3 minutes. My initial steep of White Christmas was for 2 minutes. 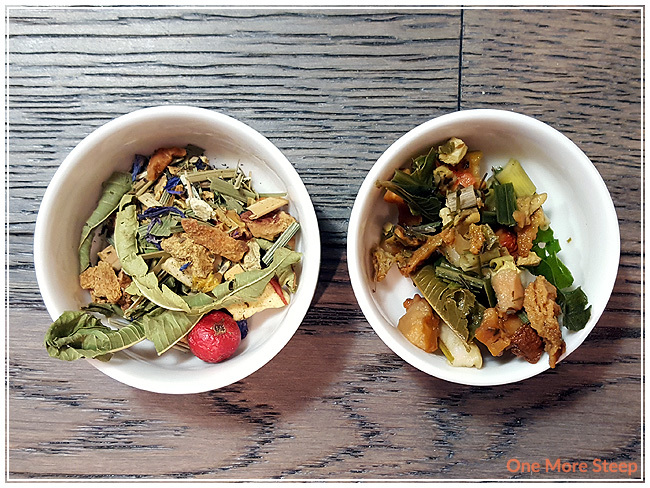 La Beauté Tea (Pacifique Herbal Infusion): steep in 100°C (212°F) for 10 to 15 minutes. Seemed a bit long, but I allowed it to steep for 10 minutes. 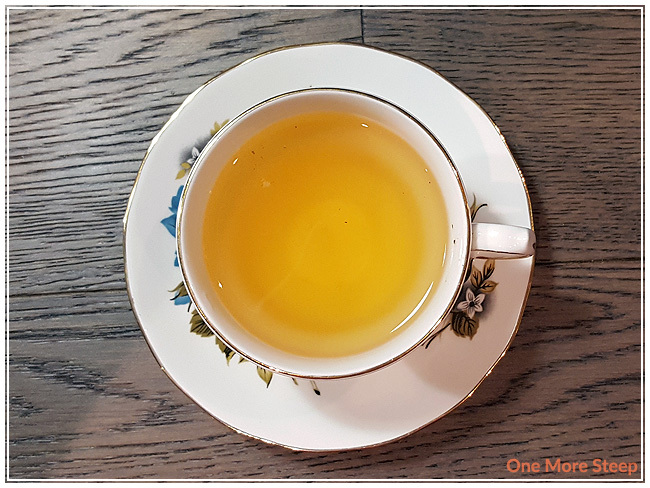 Amaretta steeps to a deep golden orange, I found that the aroma of this flavoured black tea very much matched the aroma from the dry leaf (almonds and vanilla). The flavour is primarily that of the almond, with the sweetness of vanilla in the background. The black tea base had a bit of a bite to it, like a breakfast tea. 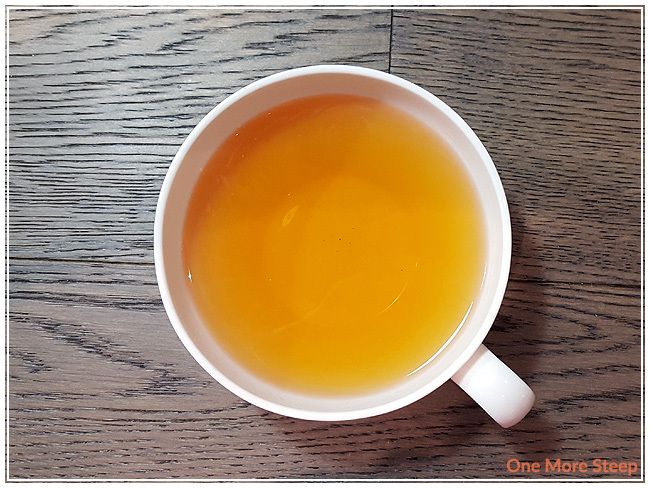 I did wind up adding a little bit of honey and that helped to brighten up the vanilla flavours in this black tea blend. White Christmas steeps to a light golden orange, with the aromas still matching up to the dry leaf – being primarily cinnamon and ginger. I found the flavour to be quite warming, thanks to the spices. The white tea base helps to keep the tea light, while the rose petals added the very nice touch of a floral sweetness. I didn’t find that this tea needed anything added to it, the floral aromas were quite nice. La Beauté Tea steeps to a lovely light yellow. It stills smells like its strongest herbal ingredients – ginger, lemongrass, and mint. When I tasted this tea, I got a burst of lemongrass, mint, and the heat from the ginger. 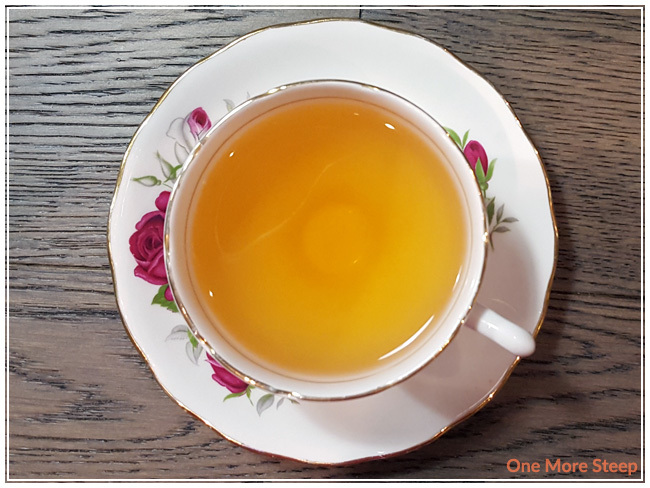 Delicious, but I did add a touch of honey – this helped to temper down the heat from the ginger, while helping some of the sweeter elements come out (apple and carrot). 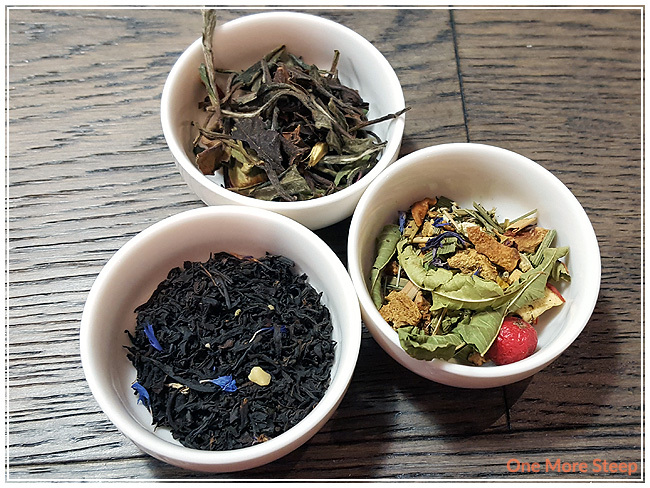 I resteeped all three of these tea blends. Amaretta did the best, with three additional steeps. I found that the vanilla flavours were mostly gone by the second resteep, so if the vanilla was your favourite part, perhaps keep this to just one more steep. White Christmas did quite well for two additional steeps, and the cinnamon and ginger flavours stayed strong for both steeps and were enjoyable. I enjoyed the warming flavours of the spices. And then there’s La Beauté Tea. This herbal infusion didn’t do that well with another steep, I would say it’s good for one steep only. 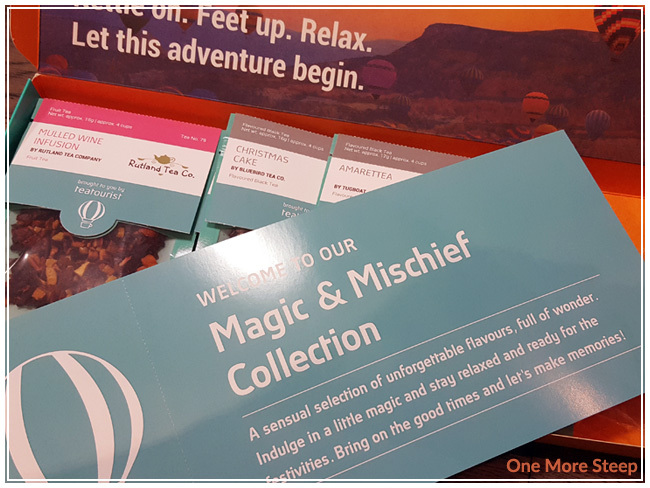 I loved the Magic & Mischief Collection by Teatourist. For £11-15 (approximately $15-22USD), it’s really not a bad deal. Considering you get 6 tea samples (12-15g/sample), I’m not sure if the fudge comes with every box (but it’s so good) so I won’t take that into consideration, but for 72-90g of tea and to sample 6 teas from different 6 tea companies with such a variety of blends, I definitely think that the cost is worth it. 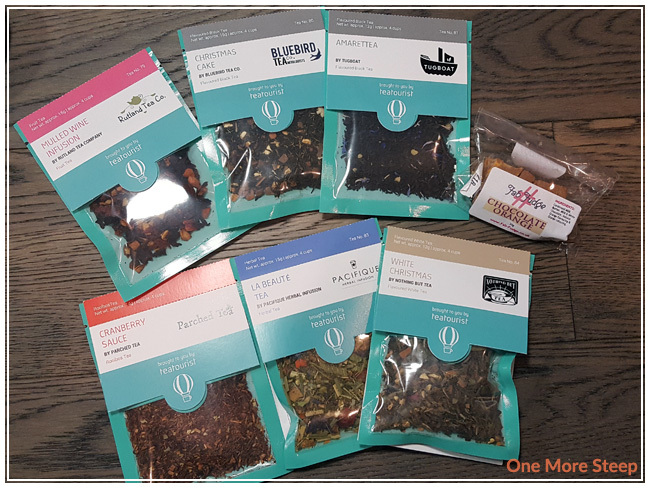 For a great bonus, if you want to buy more of any one tea that you really liked, you get coupon codes for each tea company.